Matar paneer recipe Is famous north Indian recipe which is a combination of paneer (cheese) and a matar (peas).It can be served with roti or pranthas, naan, rice, puri etc.Here I am giving you a simple recipe to make it at home. 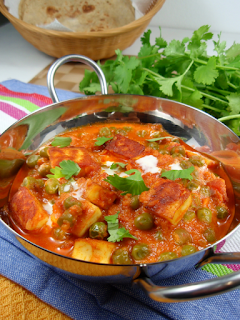 To make a paneer take a pan add milk and bring it to boil. Stirring occasionally to prevent skin from forming on top. Add lemon juice and stir till milk curdles (curd separate from whey). Place muslin over bowl. Pour curdles milk into muslin and strain. Reserve 2 and 3/4 cups whey. gather up corner of muslin and tie about 5 cms. Hang this bag for about 30 minutes. Gently squeeze bag, take down and place between two cutting board about 2 and 1/2 kg heavy object (saucepan filled with water) for about 2 hours until paneer layer is 1 cm thick. Remove weight. Untie bag and remove. Cut paneer into square shape or cubes. Firstly grind together ginger, garlic and onion into paste. Now, take a cooker add oil and heat it. Add the grind paste and cook it till golden brown. Now, add finely chopped tomato. Cook till tomatoes are pulpy and oil shows separately, stirring occasionally. Add, turmeric powder, coriander powder, cumin powder, red chilli powder, salt, all ground spices. Cook it for 1-2 minutes. Now, add water and peas (matar). close cooker. Bring to full pressure on high heat. Reduce heat and cook for 1 minute. Remove cooker from heat. Releases pressure with slight lifting of vent weight. Open cooker. Place cooker on medium heat. Add paneer and simmer about for 5 minutes. For making a matar paneer, put the oil in a microwave proof bowl. Add a cumin seeds, turmeric powder, coriander and chilli powder. Add chopped onion, ginger paste and garlic paste. Microwave on high again for 6 minutes. Add paneer and peas. Stir. leave to stand 3-4 minutes. Garnish with chopped coriander leaves and cream. Serve hot with rice or chapaties. You can also you ready made paneer (cheese). You can also add boiled potato at pressure time.